Forged by legends and bearing the might of immortal beings, artifacts possess world-shattering abilities far beyond the powers of even the most devastating mortal magic. But artifacts are born, not merely crafted. Behind every incredible artifact lies an equally remarkable tale, the sort of history that time and wonder transform into legend. Incredible weapons like the Axe of the Dwarvish Lords and the Seven Swords of Sin grant wielders the tools to raise or devastate nations, magical wonders like the Codex of the Infinite Planes and the Book of the Damned unlock secrets no mortal was meant to control and unbelievable treasures like the Orbs of Dragonkind and the time-shattering Staff of Ages grant bearers mastery over the laws of reality. Power to rival the gods and the truths behind the Pathfinder campaign setting's deepest secrets lie within - but are only for the bold. New, revised, and expanded rules for more than 60 major and minor artifacts, from the focuses of fan-favourite adventures and Adventure Paths to legends from the annals of roleplaying game history. Ramifications of employing every major artifact, presenting in-game considerations, advice, and adventure hooks. New options to help players research artifacts and unlock their secrets. Metagame artifacts, giving GMs campaign-altering tools to tackle common game table concerns such as forgotten familiars and rebuilding characters. 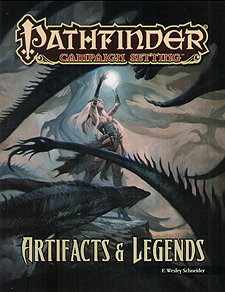 Artifacts and Legends is intended for use with the Pathfinder Roleplaying Game and the Pathfinder campaign setting, but can be used in any fantasy game setting.